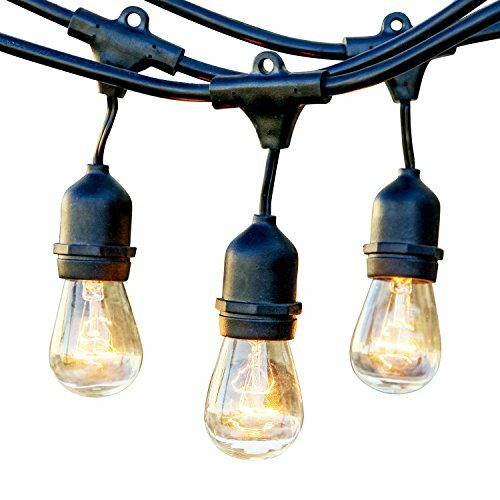 TRANSFORM YOUR BACKYARD INTO A BISTRO: These heavy-duty strands in black casing lend the retro look to your café lighting or holiday entertaining with fifteen clear 11-watt S14 incandescent bulbs on a 48-foot length strand. 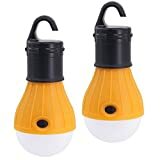 Bright enough to dine by without being overpowering, these bulbs measure approximately 3½ inches long by 2 inches wide. The exposed filaments, patterned after the Edison style, mesmerize guests with their nostalgic glow. We include an extra bulb, so you'll have a spare handy. STRONGEST PATIO LIGHTS ON THE MARKET: Built using durable WeatherTite technology, Ambience Pro illumines your landscape while layers of insulation protect the strand from extreme hot/cold temperatures and rainy, windy, or damp climates. Rubbery and flexible, it's much thicker than a traditional cord. Confidently leave on display through summers & winters. UL listed, Ambience Pro was designed to withstand the wear and tear of year-round outdoor use. VERSATILE DESIGN & OLD SCHOOL LOOK: With three feet of spacing in between each bulb, you can connect up to 8 strands end to end, then custom arrange your light from tree to tree or in a chandelier-style cluster; loop on each socket makes for easy installation using eye hooks, zip ties, or 16-gauge guide wire (1/8 or 3mm diameter;available at home improvement/hardware stores). To keep multiple strands together across a long distance, use electricians' tape to secure the plug connections. A SOFT AMBER GLOW, COMPATIBLE WITH DIMMERS: For greater flexibility in mood lighting, power your lights to a dimmer switch. Neutral casing blends with any décor, and the soft amber glow of the bulbs will enhance porches, pergolas, patios, gazebos, and more in nighttime celebrations or romantic dinners for two. 110 volts only (will not plug into 220v outlets). The bulbs are wired in parallel circuits - if one goes out, the others will stay lit. THE WARRANTY: Brightech stands behind our products 100%. All our light strands come with a full 3-year warranty. If for any reason you are not satisfied with your purchase, please contact us. Our industry-leading commitment to you will make things right! Durable and ready for any kind of weather, Brightech's Ambience Pro Outdoor Lights feature "WeatherTite" technology, which means we've built the wire with extra levels of protection. We've also wrapped it in a strong rubber casing so our strands will hold up to the harshest weather conditions. "WeatherTite" makes our product last much longer compared to lesser quality lights on the market. 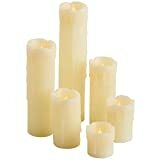 Our light strands are well insulated and you can leave them outside all year long, even during cold winters. Rains will fall and winds will blow, yet these heavy-duty weatherproof light sockets are strong enough to withstand the wear and tear of outdoor use year after year. Slightly tinted amber, the included 11-watt incandescent bulbs (165 watts total) are bright enough to enjoy an outdoor meal. Satisfied customers tell us these gently swaying bulbs have a look reminiscent of falling stars. Tether up to 8 strands together: nothing needed to connect additional sets; they plug into one another. Lights may be attached to a dimmer for greater versatility in lighting effects. Sit back, relax, and bask in compliments from your neighbors! 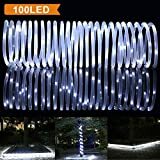 The length of our cord (choose from 24-foot or 48-foot models) lets you arrange light strands in a variety of patterns, from tree to tree via zip ties or in clusters. For installation, we recommend using a 16-gauge guide-wire and then affixing the lights every three or four to the guide-wire or anchor the heavy-duty strand with cup hooks into material that can support the weight. If you're staging a canopy, we strongly suggest you suspend strands from tensioned and anchored wires and spread the load across truss wires. (Note: Not recommended for a trellis or for combining with paper lanterns.) The lights power up via plug-in 110v outlets (not designed for use in 220v outlets).